Sig-Sauer, most commonly referred to as Sig, is one of the fastest-growing firearms companies in the United States, expanding from pistols and rifles into optics, ammunition, and training. In January of 2017, Sig Sauer Inc. was awarded a $580,217,000 federal contract by the U.S. Army Contracting Command for modular handgun systems including handgun, accessories and ammunition to replace the Beretta M9 handgun. The P365 is the pistol that created the most buzz at the 2018 SHOT Show. Its full name is the “P365 Nitron Micro-Compact.” The factory published specifications follow. According to Sig, in the case of this specific striker-fired semi-automatic pistol, the handgun was essentially built around the magazine. That is the big message of this handgun: better capacity than anything else in this slim form factor, with Sig's new ultra-thin double-stack magazine that bumps up the magazine capacity to 10 rounds as supplied, or 12 rounds with its optional extended magazine. When it comes to defensive gun use, however unlikely it may be, there is no telling what capacity you might need. It may be no shots fired, it may be one assailant, but it could just as easily be three assailants. General statistics aren't that relevant, for the only thing that matters is the one incident sometime in the future, if indeed there is that incident at all. One-incident reporting is hardly sensible way to view things (quite tragically, that's how government sometimes likes to make law), but in the case of self-defense, it is just Boy Scout's Motto. This Sig is +P rated, comes with excellent “X-Ray 3” sights: their 3-dot tritium array that boasts a half-life of 12 years. It goes up against such popular models as six-round Glock 43 that was introduced in 2015. 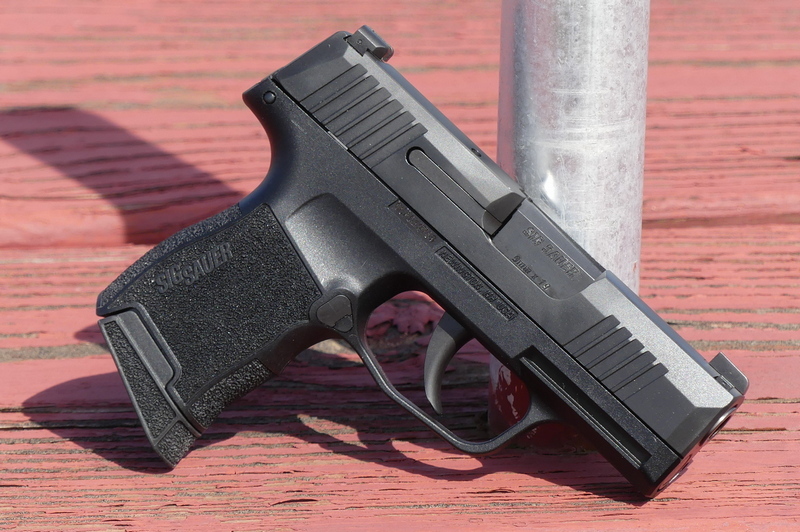 The Sig P365 is actually minimally thinner and lighter (unloaded weight) than the Glock, though not enough to matter. The extra capacity does matter, though: it has fully twice the capacity when using the Sig 12 round magazine. Personally, I don't care for 9mm pistols that force me to hold on to them with only two fingers around the grip, so the supplied 10 round extended grip magazine is more pleasant for me to use than the completely flush-fitting magazine. I have a 12 round magazine on its way as well: I suspect I'll like that the best of all. Like many 3.1 inch tilt-barrel pistols, the accuracy of roughly 1 inch at 7 yards from a rest is more than needed for close-range defensive purposes. In casual shooting, it is far more accurate than minute of bad guy. The trigger breaks at about 6-1/4 lbs., perfectly appropriate for a pistol of this type. Soon after the initial release of the P365, Sig made a few updates: the X-Ray 3 sights (replacing Siglite sights), a bit stiffer mainspring, and relief cuts in the barrel. My understanding is that everything shipping now includes all the updates. This platform of carry pistols is extremely popular and likely always will be. In the case of the Sig P365, it really is all about the magazine. It is the 10 round and 12 round factory magazines that allow this pistol to shine compared to the Glock 43, the Ruger LC9s, the Walther PPS M2, and so forth. Ejection is positive, even with 100 grain Hornady Critical Defense loads. I used a variety of ammunition from 100 grain bullet weight up to 147 grains and had zero malfunctions of any type. There was no so much as a suspicion of a jam or any failure of the gun to go back into battery. As far as I can tell, the Sig P365 is non-fussy and scores perfect reliability. My only quibble with this handgun is the trigger. While there are far, far worse and the P365's trigger is light enough, there are several false stops and stutters when pulling the trigger deliberately. This P365 has a gritty trigger that is anything but smooth. The rest of this handgun is outstandingly good, perhaps that is what makes the trigger stand out, not in a good way. Sig will sell a ton of these pistols, for the fundamental build quality is excellent, the reliability is flawless, the factory sights are excellent, and the innovative magazine with 10 or 12 capacity propels the Sig P365 into a class of its own.